You read that right. 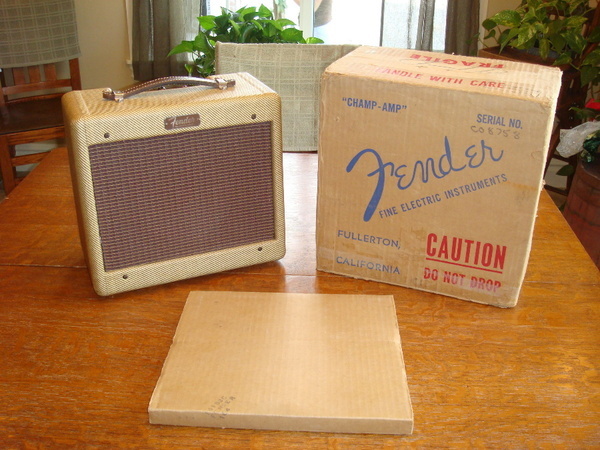 What we have featured today is a vintage 1958 tweed Fender Champ in amazing condition, still in its original shipping box. From this box, we can see that it is serial number C 08758. Dating this amp by serial number alone puts this amp as being manufactured at the tail end of 1958 and makes it a 5F1 model. We were gifted this incredible photo by Terry Foster, one of the authors of Fender: The Golden Age 1946-1970. Check out this blog on what went into producing the book. It has been recently updated with lots of great teaser photos. Amazing stuff and it is on my wish list for when it publishes later this spring. I don’t even now where to begin this is such an amazing find. To see a vintage amp in pristine condition, complete with its original box, is almost too much to comprehend! That is an amazing find. Man you read about this kind of thing but how cool would that be to have a grandpa just pull an old box out of the closet with a vintage amp in it.